The eclectic thoughts of Lady Autie, a wedding and event planner. I know what you're thinking, "The Great Gatsby, again?" But wait, before you think this post is about the movie, it's not. 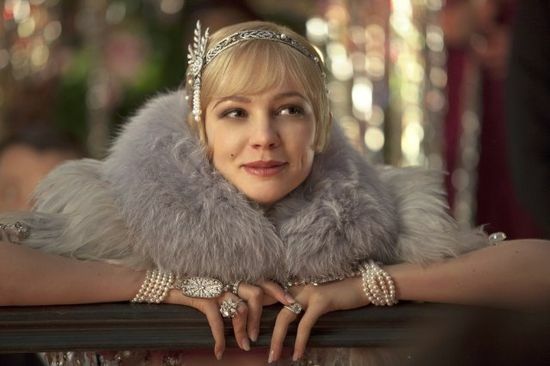 I simply want to break down the elements of what many are calling "The Great Gatsby" theme. Jewels and furs and bling, oh, my! Let's first layout that The Great Gatsby is merely one direction you can take the 1920's theme. All of the glamour and "do it big" attitude is certainly appealing, I can't deny that, but glamour can be quite expensive. Still, there are the big hall parties, big plume feathers, short sequin dresses and short hair. All of which can still be done without breaking your budget. Another thing that the posters of The Great Gatsby embody is the Art Deco side of the 1920's. Art Deco is defined by the many crazy geometric shapes and bold colors. Think, The Crest theater in downtown Sacramento. Here's an example of a budget friendly version of the 1920's theme. Black and white gives the theme a bold contrast in color. An oversized martini glass with clear beads holding up the ostrich feathers makes the centerpiece. The favor is a tulle wrapped favor tin. The invitation and the table numbers are using the Art Deco style design and text. Check out Eclectic Wedding's, a Sacramento wedding planner, 1920's Pinterest board for more ideas! Eclectic Weddings had the wonderful challenge of putting together a Star Wars themed display for the West Sacramento May the 4th Be With You Star Wars Celebration. A lot of fun, the celebration was! I'd like to share with you my process in putting together this display. Of course, the first place I went to for ideas was Pinterest. I searched the rest of the internet too, but I couldn't find much more there. Some of the result of what you see on Pinterest came from searching the internet for specifics, like a wedding dress for the dark side. The first thing I did, was head to Think Geek and purchased their light saber candles. These are a MUST have for any Star Wars wedding! I also ordered some cute light saber candies for favors (also from Think Geek) and submersible LEDs. I'm sure you get as excited as I do when you receive an order. I treated it as a special moment. I waited patiently for the end of the day when my boxes finally arrived. I was very impressed by the packaging alone for the candlestick holders. They are of greater quality than I expected. Of course, for $25 each, they better be of great quality... To say the least, I wasn't disappointed. The candies were also nice. Yes, they actually light up! As for the LEDs... Well... Let me just show you. It came in a pack of 10. Nice, now how do you turn it on? DO NOT point a LED towards your eyes as you turn it on! Ouch! Anyway, I used about three of them per bowl along with some water gems to make the Jedi side centerpieces. I loved the idea of having Star Wars Napkins, but was disappointed to find a severe lack of them on the internet. So, I went searching for an iron-on transfer I could use. Unfortunately, there was a severe lack of those as well. There were patches, but those are a bit thick for a napkin. The next best thing came to mind... I'll make one! I found the best images of the Rebel and Empire Insignias and printed them onto inkjet printable iron-on transfer sheets. The napkins are 100% polyester. The directions were easy to follow and I was very happy with the result! These invitations are a custom design put together by a contact I have with Papyrus using some ideas I tossed at her. In less than a week's time, these were the result. So there you have it! That wasn't so hard, was it? You can refer to my Star Wars Pinterest board for the items I couldn't display and Eclectic Weddings' gallery page for other theme ideas. I ran across an article by The Knot called What's Hot! New Wedding Themes for 2013. Naturally, I was interested. What inspired me to write this post was their definition of a "Geeked-Out" theme. What they describe there, I would call a Techie Theme. Having an awesome website, virtual guests, and a QR code on your save-the-dates all sounds awesome, but there's so much more to "geeking out" than whipping out what new technology you have. A very specific theme, but there are different approaches you can take. The most obvious is taking either the Empire's side with the bride dressed as Padme and the groom as Darth Vader (or Anakin), or taking the Jedi's side with Princess Leia and Han Solo. You can also just take inspiration from Star Wars and use the title crawl style font on your invitations and/or menu cards, sprinkle stars everywhere, and use a light saber to cut your Death Star cake. Think castles and wands and robes. Don't forget to insist your officiant wear a very long beard. Empty owl cages and a variety of brooms would make nice decor. Preston Castle might be the perfect place for this kind of theme in Sacramento. Check out a few more themes here. They aren't quite as geeky, but there's nothing stopping you from making them so. In this day and age, there has been a much broader definition of what's being considered "normal." Normalcy is a matter of perspective, but let's consider what popular media finds is abnormal. Geeks are a great example of this. How many TV shows are out there about geeks and nerds now? Gamers are high on the popularity charts too. I could label myself as a geek, nerd, gamer, etc. But why should anyone have to label themselves like that? Most importantly, you are you! A certain personality does not exclude you from anything. If you absolutely love the Mario games, then why not add some of that, who you are, into your wedding? Search Pinterest for "Mario Wedding" and you'll see what I mean. If you'd like to see other theme ideas, take a look at Eclectic Weddings' Pinterest Boards. If your favorite color is black, don't let what you usually see in the wedding magazines stop you from having it as the main color in your wedding. No, you do not have to wear a white wedding dress! My wedding dress will be a dark red. This goes the other way around too. If you truly wish to have the traditional white wedding, accepting who you are and what you want will free you to do so. You may run up against those who believe "you probably should..." or "wouldn't it be better if..." and insist that you take their advice. Suggestions are fine, but remember that this is your wedding and you have the freedom to make it how you want it. Consider their advice then politely smile and nod and change the subject. Wedding planners are not only there to help you plan your wedding, they are there for emotional support, to help guide you in creating your dream wedding vision, and to help relieve stress. Congratulations, he's proposed and she said "yes!" So, what now? Here's a list of things to do to help you plan and stick to a wedding budget. Well, weddings cost money... An average of over $25,000 in fact according to CostofWedding.com. And this doesn't even include the honeymoon. So, the first thing you should do is figure out where that money is coming from. Your parents, yourselves, a wedding loan, and/or whoever else might be contributing to your special day. CostofWedding.com does a good job of giving averages for each of the different vendors you'll need for your wedding. Take their numbers and redistribute the money based on your priorities. If you don't want flowers at your wedding, then dump that money into splurging a bit more on your wedding gown, that fabulous meal for your guests during the reception, or perhaps a talented guitarist for your cocktail hour. Now that you have your budget, here are a few tips for sticking to it. There are lots of free online tools out there for tracking your budget. WeddingWire.com has a decent budget app on their website. It allows you to make notes, add or remove items, and adjust the budget for your needs. It also gives estimates for each of the categories for you. You can also make note of how much you've already paid and how much is left to pay. THIS IS IMPORTANT! If you splurge in one area more than estimated, you must compensate for it in another. For example, if you just could not resist hiring that darling (and expensive) photographer that takes those perfect shots you've been envisioning for your wedding, you may have to say good-bye to your dreams of having a videographer. Try to resist even looking at vendors and venues that are outside of your budget. You must be strong for this. If it turns out that your allotted amount for a particular area is unrealistic, then readjust the budget and your priorities. Not picky about the invitations? Consider making them yourself if you have a bit of a design eye or ordering from Vista Print. Not too interested in a designer wedding dress? Try shopping at a discount bridal store (not that they don't have great wedding dresses). The most important thing of all is not to stress. If all of this seems overwhelming, consider hiring a wedding planner. A wedding planner will be able to set up a budget AND help you stick to it. For another perk, a wedding planner will be able to obtain discounts for the vendors in their network. Send me an e-mail at ladyautie@weddingseclectic.com if you'd like an obligation free consultation. Do you know anyone born on a special day? Of course, your birthday is special just by itself, but what about days like Christmas Eve, Thanksgiving, Halloween, Leap Day, or Valentine's Day. I was born on Leap Day myself, but this post isn't about me. It's about my green-loving fiancé who just happened to be born on St. Patrick's Day. Since I love surprises, I decided to plan a surprise birthday party for him. The day started out normal as our group of Dungeons and Dragons (also known as DnD or D&D) friends came over to play for a few hours. Of course, they were in on the surprise. While we were playing, a pre-specified person would call my fiancé to invite him out for a drink. This person was to have Peter away from the house for an hour while our DnD friends plus other guests invited to the party prepared the house with decoration, food, etc. He comes back, we yell "surprise!" and everyone is happy. The pre-specified person called me in the middle of playing to say that he couldn't follow through. With my fiancé at the table with me at the head running the game, I couldn't very well announce this to anyone. Thank goodness for text messaging! A flurry of text messages were exchanged among me and my friends. Since being on our phones is part of the norm, it went unnoticed by my fiancé. We had nothing prepared for dinner so I suggested we go pick up pizza. "Hun, would you mind going to pick it up?" I said. "And would you mind keeping the birthday boy company?" I suggest to one of my friends. Picking up a pizza takes no time at all, so I suggested a few items be picked up from the store too. When a text came to me from my friend saying they were on their way back, I asked for stalling since we weren't quite ready. In short, he stalled for the perfect amount of time for the rest of the guests to arrive and us all to get ready without any suspicion. Welcome to my new blog! My name is Autra, or you can call me by my internet name, Autie. Here is where I'll be talking about weddings and events I'm planning and giving planning advice along the way, websites I'm working on, and my photography ventures. Just a tidbit about me and why I call myself "Eclectic." My interests vary widely from books, to writing, to planning events, to technology and this is only the start of the list. I must also mention that I am a proud geek. I have been this way since before it was cool. ;) Ask me about it and I just might write a geek out blog post. Let's kick off this first post with an engagement party in the works... My own. Oh, did I mention that? I'm also a bride. We were engaged in Paris. The proposal happened during a dinner cruise on the River Seine as we were passing the brightly lit Eiffel Tower. Ah, it was such a wonderful (and cold!) moment. We were on our 3 week vacation through 4 countries. We want our engagement party to reflect the amazement and joy we felt during that time, so one thing we're planning to do is display the scrapbook we're putting together from the trip. Since we are hosting our own engagement party and there's not much room in our $20k budget, we want to keep the costs low. (Though traditionally the hosting of the engagement party went to the bride's parents, more couples are opting to host it themselves for one reason or another. Check out this article on The Wedding Channel for more info.) It just so happens that there's a caterer named Addy's Paella that has reasonable prices for their paella pans. This is relevant to our vacation because it was in Barcelona, Spain where we had paella for the first time. Addy's doesn't require a kitchen so this makes it simple to find an inexpensive venue. The venue search will have to wait until a later post, however. For now, I want to express my excitement for having another outlet for creativity and another medium for interacting with you all! Visit my event planning website.